Shoulders do a lot of work but don’t get much attention. The joint moves in more directions than any other in the body, but that range of motion comes with inherent instability that leaves it susceptible to injury. 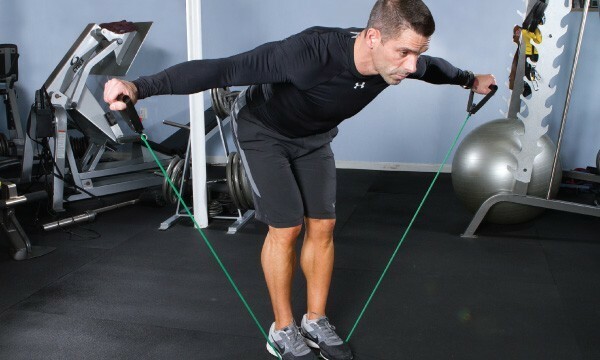 The consistent resistance a band provides helps tone traps without the risk of herky-jerky dumbbells. The bands come in a range of tensions, each distinguished by color and can be used to work nearly any part of the body. They’re also small enough to toss into a travel bag for hotel room workouts. Straighten a band on the floor and step on it so the arches of both feet straddle the band. Keep feet close together and lean forward at the hips so the back is as close to parallel with the ground as possible. Grab the handles and keep arms down at each side. Pull the hands up and away from the body to chest height—any higher calls in back muscles, reducing the effectiveness of this isolation workout. Pause and squeeze the shoulders at the top of the movement, then slowly lower the hands to the resting position. That’s one rep; do 15 to 20 more and if that’s too easy, spread the feet shoulder width apart to increase tension.